Price is $7.00 pound, sold in 2.5 and 5 pound bags. Rainbow Sticky Stones are something new. Regular Sticky Stones have a silver sheen, these have a rainbow hue. Sure to be a big hit. 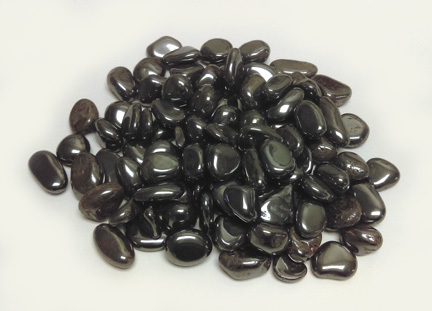 Sticky Stones are actually magnetic Hematine which is a synthetic form of Hematite. They are powerful magnets that your customers can't stop playing with! These irregular shaped pieces will vary in size from .75" to 1" stones. Price is $4.50/lb, sold in 11 lbs bags. 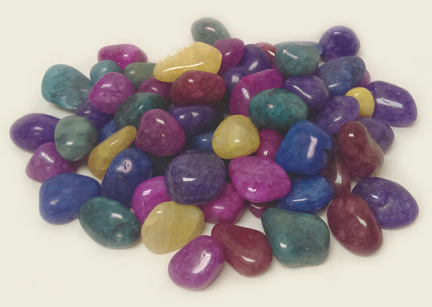 This is a great supplement to brighten your Gem Stone Mixes. Imagine tumbled clear Quartz that has more inclusions than normal, and is tinted in different colors. That's Sparkle Quartz! Available in Large (1" - 1 3/4") size. Sold only in 11 lb. bags in assorted colors only. 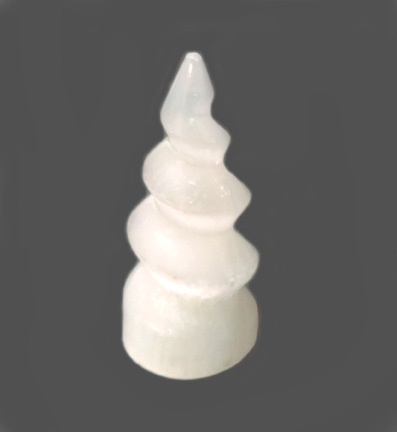 Another addition to our growing collection of natural stone items is this white Selenite Twist from Morocco. Looks wonderful on the L.E.D. Lightbox. Point is oblong in shape and is flat on the bottom. Size is approximately 4.5" tall and around 1.75" across at the base. 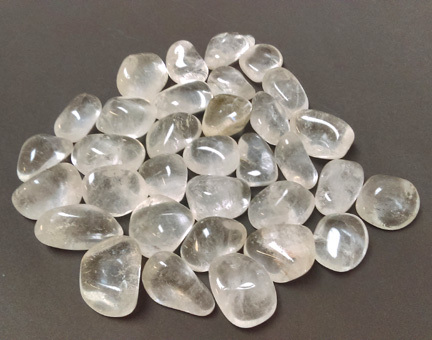 Clear Quartz Tumbled Stone is available in two sizes. Sold in 2.5 lb. bags. A large display more suited to a medium to large store. Rainbow Sticky Stones are the newest version of the magnetic hematite product. It is brilliant in its color. It is actually magnetic Hematine which is a synthetic form of Hematite. These powerful magnets are a must have item. It will engage your customers and leave them with a smile. These irregular shaped pieces will vary in size from .75" to 1" stones. Dimensions 15"H X 18"W X 11"D, Call for details. Reorder price for Rainbow Sticky Stones is $6.00 per lbs when ordered in 50 lbs box increments. 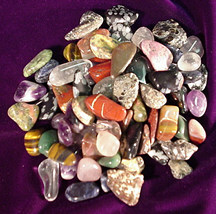 To buy Rainbow Sticky Stones in less than 50 lbs Box go to the Tumbled Stone area. A smaller display that can fit in any sized store. Rainbow Sticky Stones are the newest version of the magnetic hematite product. It is brilliant in its color. It is actually magnetic Hematine which is a synthetic form of Hematite. These powerful magnets are a must have item. It will engage your customers and leave them with a smile. These irregular shaped pieces will vary in size from .75" to 1" stones. Display Fixture Dimensions (opened): 12"H X 11"L X 9"D, Call for details. Reorder price for Rainbow Sticky Stones is $7.00 per lb. Reorder Rainbow Sticky Stones in 50 lbs increments at a discounted price of $6.00 per lb. Sold in 5 lb bags at $47.50 per bag. Approximate size ranging from 1/2" to 2". Peacock Copper is also known as Chalcopyrite. Due to its color and high copper content, chalcopyrite has often been referred to as "yellow copper". Often referred to as Bornite, Peacock Copper has a rich bouquet of colors. The colors come from an iridescent tarnish that forms on bornite upon exposure to air. This stone brings out joyfulness. It bestows the ability to see and accept the joy in any moment. 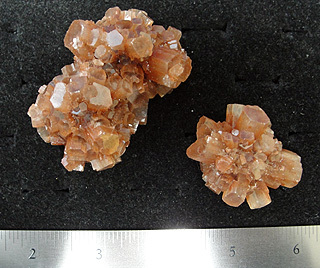 This naturally occurring Moroccan crystal carries subtle earth tones of reddish brown color from iron rich minerals. Each piece is unique and priced to sell. 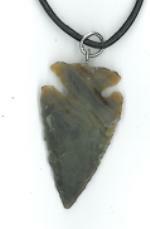 These attractive Replica Arrowhead Pendants will be a big hit with your customers. This is a high-quality agate arrowhead (1"-1.5" long) attached to a 22" round black leather cord. It has a lanyard clasp that is easy to use. Appropriate for male or female. Sold in 10 LB. bags. One of our best selling products, our Moroccan Break At Home Geodes. We do so much volume on this product that we do end up with broken pieces from time to time! These are great for science classes or just right for the new amateur rock collector starting their specimen collection! A fantastic blend of different rough stone, quartz crystals, citrine, amethyst crystals, pyrite and more! Sell in your Treasure Chest Display, Mining Car, or Sluice Box! Crystals vary in size from .25" - .75". 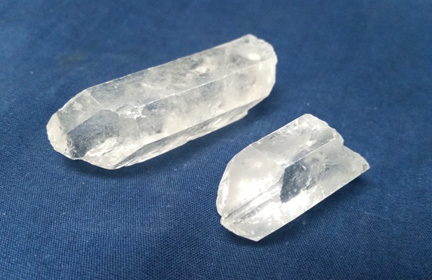 Rough Clear Quartz Crystal points are perfect for bulk bins or jewelry making. Priced at $3.00/lb, sold in 10 lb bags. This new mix has a fantastic variety of rough stones including Amethyst, Lepidolite, Tiger Iron, Quartz, and Calcite varieties and much more. 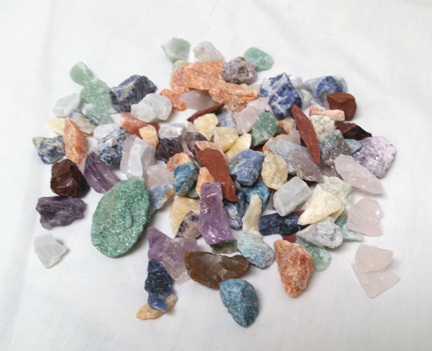 The stones included in this mix are approximately 0.25"-1.25" in size (average size of 0.5"), priced at just $3.00 per pound and sold in 10 pound bags. Sell in your Treasure Chest Display or Sluice Mix! Check out our other brand new BULK MINERALS! Search "Bulk Rough" in your search bar!